11/22/2018 - The Wildcats despite losing to Braintree finished 3-1 in Bay State Herget League play to claim its second title in four years. Prior to winning the league in 2015, Milton had not captured a league title since 1963. 11/22/2018 - In windy, frigid conditions on Thanksgiving morning, Milton’s defense was unable to freeze Braintree’s prolific run game as the Wildcats fell to the Wamps 35-21. Despite the loss, Milton took home the Bay State Herget crown with a 3-1 league record. Braintree got on the board first with a 65-yard drive to go up 6-0 late in the first quarter. Captain Smith Charles flashed through the line to block the extra point. Milton would answer back with a 60-yard drive of their own when captain Luke McMenamin took it in from 3 yards out. After a Max Winkler extra point, the Wildcats lead 7-6. The Wamps started the 2nd quarter driving all the way to the 6-yard line. But the Wildcats defense stiffened when captain Alex Caputo and junior d-lineman Kevin Swanton made a big stop on the 6-yard line. Braintree settled for the field goal to take a 9-6 lead. The lead would be short-lived as the Wildcats answered with a 10-play 67-yard drive, capped when McMenamin found Ja’mier Woods wide open in the endzone for a 20-yard td strike. Another Winkler extra point upped the Milton lead to 14-9. Braintree was unable to get a first down on the next drive and punted it back to Milton on their 42 yard line with less than 3 minutes remaining in the second period. However Milton went 3 and out and only managed a 13 yard punt. Braintree went to work and scored on a short run with seconds left in the half to claim a 15-14 halftime lead. Braintree started the second half with another scoring drive after an excellent kick-off return. Leading 21-14, Braintree recovered the ensuing kickoff after it bounced off a Milton player. They converted the excellent field position and turned it into another touchdown to go up 28-14. The Wildcats failed to get a first down going into the wild in the 3rd quarter, running only three offensive plays. On the final play of the quarter Billy Silva broke a 65 yard touchdown run to expand the lead to 35-14. Milton closed the gap to 35-21 on the next drive midway through the 4th quarter when McMenamin hit Woods again from 18-yards out. After stopping Braintree on the next series, Milton eventually turned it over on downs and Braintree ran out the clock. The Wildcat seniors ended their high school careers with a great three year run, amassing a 22-10 record, winning the 2018 Bay State Herget Championship and as well reaching two consecutive Division 4 South Sectional Championship games. 11/9/2018 - All season long, the Milton Wildcats have relied on a fast and aggressive style of play on both sides of the ball to overwhelm opponents to reach the Division 4 South Finals. But in the 2nd half of the championship game at Dighton Rehoboth, that style disappeared under monsoon rains and horrendous playing conditions, and the result was a heartbreaking 28-25 loss to Falcons in the championship game. The game certainly started on a high note for Milton as Isaiah Woodley took the opening kickoff and sped 85 yards for a touchdown to put the Wildcats up 6-0. The defense then stepped up, holding the Falcons on their first 4 possessions. The Wildcats couldn’t capitalize however as a promising drive which started with a 54-yard pass from Luke McMenamin to Woodley that got the Wildcats to the D-R 15-yard line ended in an interception. Early in the 2nd quarter, Dighton-Rehoboth got on the board with a 3-play 50-yard to take the lead 7-6. But the Wildcats would come right back on the first play of the next drive when McMenamin hit Woodley for a 55-yard td strike. The 2-point conversion was no good and the Wildcats lead 12-7. The Falcons came right back though to jump back in front 13-12. Dighton-Rehoboth would have a golden opportunity on the next drive as the muddy ball was fumbled by the Wildcats and recovered by the Falcons at the 12-yard line. The Milton defense stepped up big however and the Wildcats took over at 7-yard line. Then the offense went to work with McMenamin hitting Ja’mier Woods, followed on the next play with another TD strike to Woodley for 65 yards. Max Winkler booted through the extra point and the Wildcats took the lead 19-13. The Falcons answered with a 77-yard drive to go up 20-19 at the half. As the field conditions became pretty much unplayable in the 2nd half, both offenses ground to a halt. Late in the 3rd quarter, the Wildcats found paydirt when Woods took a Falcons punt and slipped his way for a 75-yard TD return to put the Wildcats up 20-15. The resilient Falcons then went on a long drive to go up 28-25 with 6 minutes left in the 4th quarter. Milton would get the ball twice in the final few minutes of the game but were unable to sustain a drive in the mud as time ran out. The Wildcats look to finish the season on a high note as they take on their rival Braintree on Thanksgiving morning at 10am in Braintree. 11/2/2018 - New year, better result. When Milton faced the Hopkinton in The Cage Friday night in the Division 4 South Semifinals, they had a chance to avenge last season's 28-19, loss in the D4 Sectional final. The Wildcats certainly turned the table, featuring its stifling defense to dominate the Hillers 34-7. The Wildcats only had three first half possessions but made the most out of them, scoring 3 touchdowns. After holding Hopkinton on the first drive, Milton started with an 87-yard drive, most of it on the ground with running backs Smith Charles and Moses Moiwo gashing the defense for huge gains. The drive ended with QB Luke McMenamin hitting Ja’mier Woods with a 6-yard touchdown pass. Max Winkler drilled the extra point and the Wildcats lead 7-0. The Wildcats aired it out on the next drive, as they went 88 yards in only 4 plays, highlighted by a 49-yard pass to Liam Regan and a 32-yard TD strike to Isaiah Woodley to put Milton up 14-0. Hopkinton answered to cut the lead to 14-7 midway through the 2nd quarter, but Milton came back with another quick-strike 3-play drive, when McMenamin hit Charles on a wheel route and he sped by the Hiller defense for a 50-yard touchdown. Hopkinton would again put together a nice drive at the end of the half, but junior Luke Botsford intercepted a pass at the five-yard line to end the threat. The Wildcats offense continued their onslaught at the start of the 2nd half as McMenamin hit Woods on a screen pass for a 38-yard touchdown to put Milton up 27-7. On defense, Milton only let Hopkinton cross the 50-yard line once in the whole half. Milton closed out the scoring early in the 4th quarter when McMenamin and Woods hooked up again on a screen pass and he took it to the house, this time from 48 yards out. The Wildcats will travel to #1 seed Dighton-Rehoboth Friday night at 7pm for the Division 4 South Sectional Championship. The winner will head to Gillette Stadium in December for the D4 Super Bowl. 10/26/2018 - Sometimes it’s not how you start, it’s how you finish. That was certainly true on Friday night when the Milton Wildcats met the Westwood Wolverines in MIAA first round tournament action. The Wildcats were able to overcome a tough start against a determined Westwood squad and escape with a 20-16 win at Brooks Field. The Wolverines came out in a double-wing attack, an offense they had not run at any time during the regular season and it gave the Wildcats fits early on. On their second series, Westwood went on a 64-yard drive to take a 7-0 lead. Then on the next drive, things got tougher as an errant Milton screen pass was picked off by the Wolverines and taken to the house midway through the 2nd quarter. However, Nick Griswold flashed through the line to block the extra point and keep the deficit 13-0. Milton came alive on both sides of the ball late in the half, holding the Wolverines to a 3 and out and getting the ball on the Westwood 25-yard line. Milton drove to the 1-yard line before a fumble kept the Wildcats off the scoreboard. The defense stepped up again and a 15-yard punt return by Ja’mier Woods set Milton up at the 17. On the first play, Woods then made a spectacular catch of a Luke McMenamin pass in the corner of the end zone to close the gap to 13-7 at the half. Both defenses would dominate the 3rd quarter until Milton smothered the Wolverines deep in their own territory to get the offense great starting field position at the Westwood 36-yard line. Then the Wildcats went on a five-play drive highlighted by an 18-yard pass from McMenamin to Liam Regan. Two plays later running back Smith Charles took it in from the 2-yard, and after a Max Winkler extra point, the Wildcats had their first lead of the night 14-13. But Westwood would not go quietly. They went on a clock-chewing 15-play drive, resulting in a 29-yard field to take a 16-14 lead with under 4 minutes remaining in the game. But Milton wouldn’t be denied, as McMenamin lead the Wildcats on a 74-yard drive, hitting Woods on a 23-yard touchdown, his 2nd td catch of the game with just over a minute left. Westwood had one last shot, but Alex Caputo sacked the quarterback at mid-field as time expired. The Wildcats face Hopkinton at home in The Cage for the Division 4 South Semifinal Friday a 7pm. This is a rematch of last year’s Division 4 South Championship. 10/20/2018 - Desperation is a powerful motivator and the Newton North Tigers, needing a win to qualify for the playoffs, played like the more desperate team to edge the Milton Wildcats 27-20. The loss means the Wildcats finish the regular season 5-2 and will be the #2 seed in Division 4 South for the playoffs. Newton North started strong going 70 yards on the opening drive to go up 7-0. But Milton would answer back quickly. On their second play from scrimmage Luke McMenamin hit Killian Smith with a 47-yard td pass. After a Max Winkler extra point the score was tied 7-7. Early in the second quarter Newton North drove to the Milton 7-yard line. However Milton held when linebacker Alex Caputo knocked down a pass on 4th and goal. The quick-strike Milton offense then went to work again. On the second play from scrimmage, McMenanmin hit a streaking Ja’mier Woods for a 94-yard touchdown strike to put Milton up 14-7. Newton North wouldn’t be denied on their next drive though, scoring on a 28-yard td pass. But Caputo made another huge play, blocking the extra point keeping Milton ahead 14-13. Milton came right when running back Moses Moiwo burst through the middle for a 35-yard touchdown run. After a missed extra point, the Wildcats led 20-13. The Tigers would go on another long drive at the end of the half, but junior Andrew Possi intercepted a pass in the end zone to end the threat. The Milton defense was taxed in the 2nd half as Wildcats offensive drives were stymied by 3 turnovers and a bend-but-don’t-break Newton North defense. Late in the 3rd quarter, the Tigers scored on a 51-yard td pass to tie the score 20-20. It would remain tied until late in the 4th. After a missed Milton field goal Newton North drove 77 yards for the go-ahead touchdown. The Wildcats would make a last second attempt to tie the game but a pass was intercepted on the 10-yard line to secure the Tiger’s win. Milton opens up the Division 4 South Sectional tournament when they host Westwood at 7pm Friday. 10/12/2018 - When Milton met Needham Friday night in a game with huge conference and playoff implications, everyone expected a shootout between two of the best offenses in the state. But it was the defenses that shined as the Wildcats beat the previously undefeated Rockets 22-14 to take over sole possession of first place in the Bay State Herget and put a stranglehold on the #1 seed in Division 4 South with just one game to play before the playoffs. The Wildcats swarming defense and strong special teams forced 4 turnovers and shut down Needham’s prolific run game. The game opened well for Milton as they took the kickoff and in only three plays found the endzone, when quarterback Luke McMenamin hit receiver Isaiah Woodley for a 54-yard TD pass to take the lead 6-0. The teams exchanged punts before Needham drove 38 yards to go ahead 7-6. The second quarter would feature excellent defense from both teams. Needham had the best sustained drive, but Wildcats linebacker Steven Joyce stepped in front of a Rocket pass for an interception to end the threat. After Needham turned the ball over on downs to start the second half, Milton drove to the Rockets 11-yard line and Max Winkler kicked a 28-yard field goal to put the Wildcats up 9-7. On the next drive, Milton forced a Rockets fumble to take over at midfield. The Rockets defense held and Milton was forced to punt. 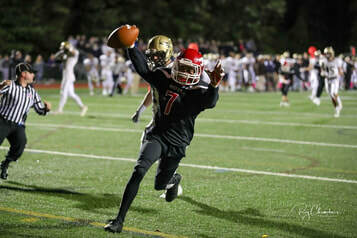 But the line-drive punt from Joyce bounced off the Needham returner and rolled into the endzone where senior Ty Weekes pounced on the ball for the Milton touchdown. After a Winkler extra point, the Wildcats lead 16-7. On the ensuing drive, Needham moved the ball to the Milton 9-yard line. But Smith Charles intercepted a Rocket pass in the end zone to end the threat. Needham closed the gap to 16-14 early in the 4th quarter on a 74-yard td pass. Then on the next series Milton answered, with McMenamin again hitting Woodley 44 yard TD pass to grow the lead to 22-14. Needham would have two more drives in the 4th quarter. On the first drive, they reached the 28 yard line before the Wildcat defense forced 4 straight incompletions. The final drive began at their 29 yard line and ended at the Wildcats 7-yard line with a 4th and goal with less than one minute left in the game. But the Rockets pass into the endzone was defensed perfectly by Charles and Ja’mier Woods to preserve the Wildcat victory. Milton closes out the regular season travelling to Newton North on Saturday afternoon at 1pm. 10/05/2018 - After two weeks on the road, the Milton Wildcats returned to “The Cage” and continued their winning ways, dominating the Weymouth Wildcats 48-14 Friday. The win was Milton’s fourth in row to bring their record to 4-1 and 2-0 in league play. Senior captains Luke McMenamin with 3 passing touchdowns and Smith Charles with 3 touchdowns lead the Wildcats. Milton held Weymouth to one first down on their game-opening drive, then went 77 yards in only five plays, highlighted By a Charles burst up the middle for a 58-yard td run. Max Winkler booted the extra point and the Wildcats lead 7-0. After exchanging punts, linebacker Nick Griswold recovered a Weymouth fumble in the backfield at the 19-yard line. Milton capitalized on the next play as McMenamin hit junior receiver Liam Regan in the corner of the end zone to put the Wildcats up 14-0. Milton opened the 2nd quarter with another quick-strike series, this time 66 yards, when McMenamin hit Isaiah Woodley with a 50-yard TD pass to make the score was 20-0 Wildcats. Then the Milton defense forced another three and out when Griswold sacked the Weymouth quarterback, and the Wildcats took advantage of the great field position, with McMenamin hitting junior receiver Jackson MacMillan for a 13-yard TD reception. Weymouth would close out first half scoring with a touchdown to close Milton’s lead to 27-7. The Wildcats continued the assault in the second half, with a 6-play 55-yard drive, capped by a 5-yard TD run by Charles. Charles would then do it on defense on the next series, intercepting a pass at the Weymouth 46 and running it back for a touchdown to make it 41-7 Milton. The Wildcats scored again on their next series on a 1-yard Moses Moiwo run to up the lead to 48-7. Then Weymouth closed out the scoring with a 4th quarter touchdown for the 48-14 final. The Wildcats face a huge test next week as they welcome undefeated division rival Needham to Brooks on Friday night at 7pm. It will be senior night as we honor our players and cheerleaders. 9/30/2018 - Milton opened up Bay State Herget league play travelling to face the Walpole Rebels Friday night. The Wildcats dominated early building a 27-0 halftime lead and cruised to a 34-16 victory to raise their record to 3-1 overall and 1-0 in conference. The Milton offense started slowly, turning the ball over on consecutive drives to start the game. But the defense was up to the challenge with both Walpole drives ending in punts thanks to solid run and pass defense. On it's third drive Milton quarterback Luke Mcmenamin hit receiver Isaiah Woodley on a 41-yard td strike and Max Winkler added the extra point for a 7-0 led. As the 2nd quarter began the Rebels were near midfield when defensive lineman Bryce Stovell intercepted a Walpole screen pass, bringing it back to the 32-yard line. On the next play McMenamin connected with Jamier Woods on a pass to the one-yard line. Moses Moiwo capped the drive with a one-yard td run to put the Wildcats up 14-0. The defense again forced another 3 and out by the Rebels and Wildcats went on an 82-yard drive behind some great running by Smith Charles and Moiwo. McMenamin hit paydirt with a 17-yard td run to put the Cats up 20-0. Walpole responded on the next drive with a long pass to the Milton 8-yard line. But the Wildcat defense would again stiffen and Milton would get the ball back on the Wildcat 11-yard line with less than a minute left in the half. On third down, McMenamin hit Charles on a screen pass and he sped 85 yards for a touchdown to up Milton’ lead to 27-0. Walpole came out in the 3rd quarter and quickly scored to close the gap to 27-8. It appeared Walpole was headed to the end zone again as they were driving again, but Charles defected a pass in the end zone and Andrew Possi picked it off to end the scoring threat. Milton will be at home next Friday to take on Weymouth in another league game. 9/21/2018 - The Wildcats travelled to the South Coast Friday night to face a tough and physical Dartmouth squad. Milton was up to the challenge as they shut out the Indians 24-0 to raise their record to 2-1. The linemen in the trenches were the stars. The o-line gave quarterback Luke McMenamin tons of time and running backs Smith Charles, Moses Moiwo and Ryan Hoey wide running lanes to move the ball. On defense, the line put constant pressure on the Dartmouth offense, who never got inside the Wildcats 30-yard line the entire game. Milton’s defense started strong, as Ja’mier Woods forced a fumble on Dartmouth’s 2nd play at their own 25. Milton cashed in quickly hitting Stephen Joyce on a 6-yard td pass. The defense forced Dartmouth into a 3 and out and the McMenamin lead the Wildcats on 5-play 65-yard drive, including a 28-yard strike to senior James Quinn. After a 6-yard td pass to Liam Regan, the Wildcats lead 14-0. Play got a little sloppy at that point as both squads would turn the ball over and suffer some untimely penalties. The Indians special teams were able to pin Milton deep in their own end for much of the 2nd quarter. But the Wildcats went into halftime with a 17-0 lead as kicker Max Winkler boomed a 39-yard field goal into a strong wind. The Wildcats closed out the scoring late in the 3rd quarter with the Milton o-line opening up huge holes for running back Smith Charles on a 42-yard drive. McMenamin hit Regan for his second td catch of the game to put the Cats up 24-0. Defense would take over at that point as the Wildcats sacked the Indians quarterback four times in the 4th quarter, two by junior lineman Rob Ricciardi and one each by captains Ryan Hoey and Alex Caputo. The Wildcats travel to Walpole Friday at 7pm to open up league play against the (2-1) Rebels. Wildcats Respond in the Cage! 9/14/2018 - The Milton Wildcats came home and righted the ship, dominating the Quincy Presidents in all three phases 49-0 under the lights in the "Cage". The offense for the Wildcats was clicking on all cylinders, but it was the special teams and defense who set the tone, shutting down the Presidents with relentless pressure and providing excellent field position. The game opened with a bang as captain Ryan Hoey took the opening kickoff and rumbled 80 yards for a touchdown. Max Winkler banged through the extra point and the Wildcats lead 7-0 After a Quincy punt, captain Luke McMenamin hit Jamier Woods in stride for a 64-yard touchdown to expand the Milton lead 14-0. The Milton defense would again come up big on the next series, highlighted by the first of four sacks by Hoey. Quincy was able force a punt on the next drive but fumbled the return. Milton captain Alex Caputo recovered the on the Presidents 21-yard line. The Wildcats would take advantage on the next play, when McMenamin hit Woods on a screen pass and he broke multiple tackles on the way to the endzone for his second touchdown catch of the first quarter. Strong kick-off coverage combined with excellent defense provide the Cats great field position to set up the 4th score of the half. The Wildcat offense went to work with a 34-yard drive, highlighted by a 15-yard catch by Killian Smith. A McMenamin rush was fumbled into the end zone and recovered by Killian Smith for another touchdown in the second quarter building the halftime lead to 28-0. Quincy went three and out to start the 2nd half, and the Milton offense would again respond with a 28-yard scoring drive. McMenamin took it in himself from 6 yards out and the Wildcats lead 35-0. Milton closed out the 3rd quarter with another TD drive, as captain Smith Charles did it all with a 26-yard run followed by a 16-yard scamper into the endzone. The Wildcats closed out the scoring with sophomore running back Andrew Lynch taking it in from 6-ayrds out in the 4th quarter. The Wildcats travel to the South Coast to take on the Dartmouth Indians next Friday night at 7pm. 9/7/2018 - Opening game jitters and costly mistakes helped the host Marauders defeat the Wildcats 31-28 Friday night. Belmont recovered an attempted onside kick to open the game, then proceeded to drive 48 yards to go up 7-0. The Wildcats came right back with a 73-yard drive, most of it on the ground, as running backs Smith Charles and Moses Moiwo along with quarterback Luke McMenamin all ran the ball well. The drive was capped with a 7-yard run by Liam Regan. After the extra point by Max Winkler the game was tied at 7. On the ensuing Belmont drive, Charles picked off a deflected pass and then on the next play, McMenamin hit a streaking Isaiah Woodley for a 48-yard TD strike to put the Wildcats up 14-7. But the Marauders strong run game would answer back with a pounding 65-yard drive. The extra point was blocked and the score was 14-13 Milton. Milton fumbled the ensuing kickoff, but held on defense as linebacker Alex Caputo burst through the line to block a Belmont 36-yard field goal attempt. The Wildcats offense then went three and out and the Marauders came back with a 78-yard drive to go into halftime leading 20-14. Belmont answered and kicked a 27-yard field goal to end the 3rd quarter with a 23-21 lead. The Wildcats opened the 4th quarter with a 60-yard drive highlighted by a 28 yard pass to Charles. McMenamin then hit Regan in the corner of the end zone from 7 yards out and the Wildcats lead 28-23. Milton then held the Marauders to a three and out, but the punt was fumbled and Belmont recovered on the Milton 30 yard line. They capitalized and after a successful 2-point conversion the Marauders took a 31-28 lead. After another Milton turnover, the Wildcat defense stepped up and the Wildcats went back on offense with less than three minutes remaining. McMenamin quickly lead Milton into the red zone, but a 4th down pass in the end zone fell incomplete and Belmont ran out the clock to preserve the win 31-28.